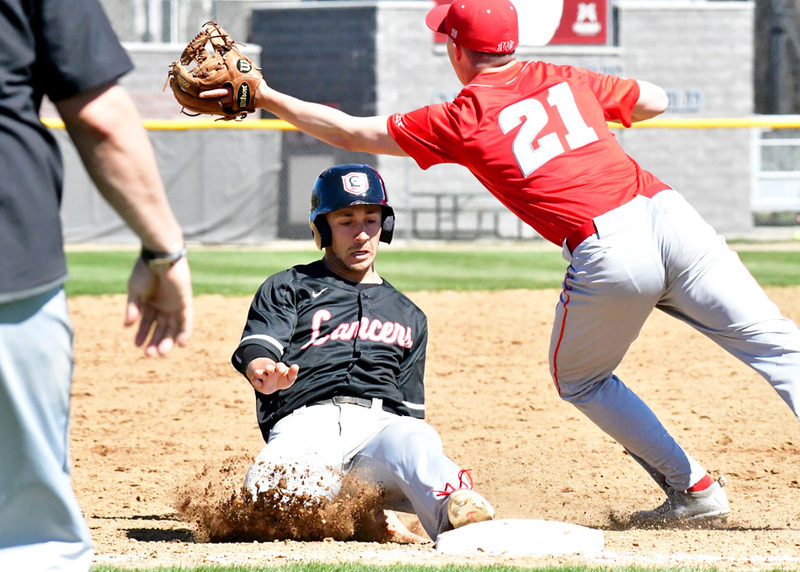 WINONA LAKE – Grace’s baseball team and Indiana Wesleyan played in an offensive onslaught on Tuesday. The teams accounted for 43 hits – 21 of which went for extra bases – in a 20-16 win for the Wildcats. Grace scored in seven of the nine innings, but the Wildcats (14-24, 8-8 Crossroads League) still managed to hold a lead for the entire contest. The Lancers (12-15, 8-8 CL) plated six runs in the first three innings, but they were somehow outdone. IWU racked up eight runs during that span and quickly built on its lead. RJ Snyder launched a two-out, three-run home run in the bottom of the second to highlight Grace’s start. After the Wildcats scored five more runs in the top of the fifth, Grace found itself in a 16-7 hole. But the Lancers continued to battle. In the bottom of the fifth, Wyatt Buzbee, Snyder and Jaron Mullett scored. Mitchell Enyart belted a solo home run in the sixth to keep Grace’s momentum. Grace’s baserunning kept pressure on the Wildcats in the seventh. The Lancers scored three runs off wild pitches during one at-bat, chopping IWU’s lead down to 17-14. IWU built up its cushion with a three-run homer in the top of the eighth, and Grace was only able to respond with two runs in the bottom of the inning. Neither team pushed across a run in the ninth inning, the only frame to not see a run scored. Snyder hit 4 for 5 with three runs and three RBIs from the No. 9 spot, and Mullett was 3 for 4 with four runs and two RBIs. Enyart finished 4 for 6 with two runs and two runs driven in, Houston Haney batted 3 for 4 with three RBIs, and Chris Griffin was 2 for 6 with two RBIs. Sam Newkirk and Xavier Harris also had two hits, and David Anderson had a run and an RBI. Grace was barely outhit 22-21 in the memorable offensive barrage. The Lancers end the week on the road, playing at Indiana Tech on Wednesday and at Mt. Vernon Nazarene on Friday and Saturday.